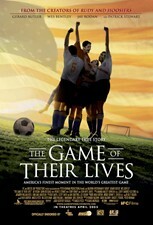 Inspired by a true story, this uplifting drama from director David Anspaugh ("Hoosiers") chronicles how a ragtag group of soccer players from St. Louis were assembled to represent the U.S. in the 1950 World Cup in Brazil. Despite overwhelming odds, the team's diverse players would go on to defeat a seemingly unstoppable English squad. Gerard Butler, Wes Bentley, Patrick Stewart, Gavin Rossdale star. AKA: "The Game of Their Lives." 101 min. Widescreen (Enhanced); Soundtrack: English Dolby Digital 5.1; Subtitles: French, Spanish.